In a large bowl combine the flour, sugar, and salt until mixed. Add the shortening and cut in with a fork until the shortening is worked in. Heat milk until warm, add the yeast and eggs and mix well. Add the milk mixture to the flour and mix until well combined. In the morning melt the 1/2 cup of butter. Combine the 1 cup of sugar and 4 teaspoons of cinnamon together and place it a container large enough to roll the twists in. Divide the dough into 4 equal parts. On a lightly floured surface roll the dough into a 9 x 10-inch rectangle. Cut the rectangle into 10 strips. Bring the ends together and pinch the end to seal. Place on a plate and brush the top side of the strip of dough with the melted butter, flip over and brush the other side, and then roll in the sugar and cinnamon. Holding the dough at both ends start to twist and twist until you have the desired shape. Place on a prepared baking pan and let rise for about 30 minutes. Bake for 10 to 12 minutes remove from oven and place the twists on a cooling rack and cool completely. Combine the powdered sugar, vanilla, and enough milk to make the icing the right consistency to drizzle over the twists. 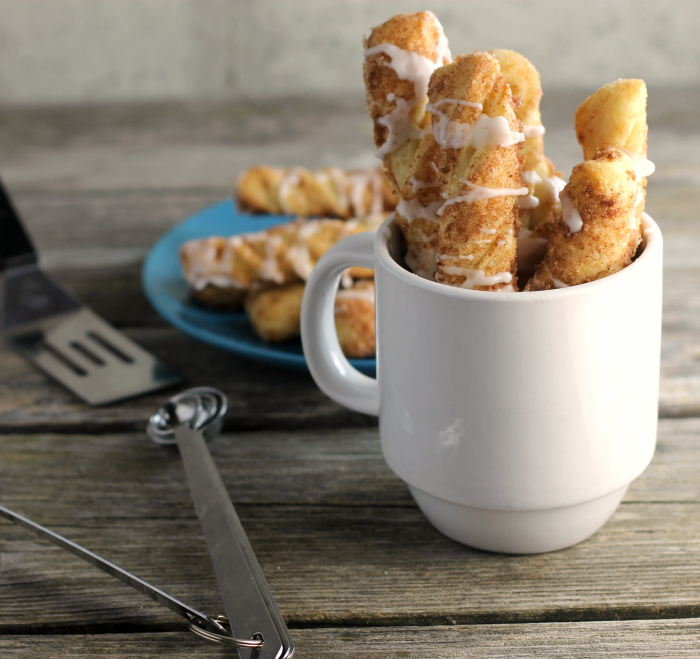 Drizzle icing over twists and enjoy.